The Organization is authorized by the relatives of the nurses to hold negotiations, to exert influence and to act for the immediate liberation of Dr. Zdravko Georgiev, Mrs. Kristiana Vulcheva, Mrs. Nassya Nenova, Mrs. Valentina Siropoulo, Mrs. Valya Chervenyashka, Mrs. Snezhana Dimitrova. 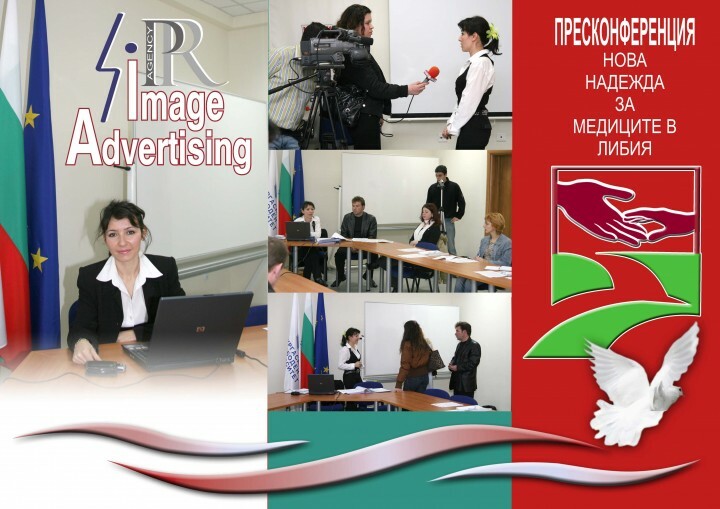 PR Agency Image Advertising is engaged by Communities of Nations for Peace as well as by the families of the medics to carry out the correspondence and the relations between the two parties, with the aim of non-problematic and effective communication. “The personal opinion of the sentenced Bulgarian medics in Libya as well as our own as members of their families is that any kind of help in this critical situation may lead to a positive result.” is said in the official letter of the relatives to the UN’s organization and the PR Agency. The idea to intervene the United Nations directly, emerge right after the confirmation of the death sentences on December 19th, 2006. It was finally realized after intensive conversations, contacts and correspondence between the UN’s representatives and the Bulgarian PR Agency Image Advertising with the medics and their families. The significance of such interference is unique till the moment, because it transforms the problem with the accused nurses into universal and world-wide one, as that goes beyond the scope of the EU. In this way the attempts of the Libyan government to provoke confrontation between the civilizations and the religions, using the European support of Bulgaria in a negative way and creating international front against the EU, is doomed to failure. PR Agency Image Advertising and Communities of Nations for Peace decided to function for the liberation of the Bulgarian medics in Libya, inspired namely by this. The organization is an initiator of the official political stand of France, which is one of the first countries that took Bulgaria’s side and that work hard now in order to proof the innocence of the Bulgarian medics in Libya. At the present moment Communities of Nations for Peace is in procedure of elaboration of petition undersigned by the French Senate and Parliament through which both institutions will approach the French President and Prime-Minister as well as the European commission and will proclaim their official declaration in defense of the sentenced Bulgarians. The official statement of the UN Secretary-General Ban Ki-moon in Adis Abeba during the summit of the African union a week ago, was a result of the intervention of Communities of Nations for Peace in this painful for all the Bulgarians case. He declared that he will pose the question concerning the five Bulgarian nurses to the Libyan government and he will insist all the humanitarian appeals of the international communities to liberate the nurses, to be taken under review. One of the greatest world specialists in the field of criminal law, the famous lawyer Mr. Gilbert Colard is the President of the Comission of justice by Communities of Nations for Peace. This comission has 24 members - 12 lawyers and 12 magistrates and is working on the file of the medics under the control of Mr. Collard. His brilliant international reputation is result of the proceedings of low, considered extremely difficult, even impossible won, as well as because of his clear and unambiguous stand on defense of human rights and democratic values. Mr. Collard has worked on many cases of huge significance in the field of geopolitics, the last one of which was the defense and preservation of the sporting rights of the French footballer Zinedin Zidane right after his emotional act in the finals of the last soccer championship in Germany. The involvement of Mr. Gilbert Collard on behalf of the Bulgarian cause is a result of the legal practice of the French lawyer, considering a trial ten years ago, when he succeeded in repealing the death sentence of a French citizen, passed on him by the Vietnamese court. This political case is almost analogous to the case of the sentenced to death Bulgarian women while the liberation of the Frenchman was considered a legal “wonder” – precedent with no analogy in legal defense. Mr. Collard as well as Communities of Nations for Peace and PR Agency Image Advertising, promise to help the Bulgarian nurses in this critical situation absolutely for free, as for that purpose they will use all the resources and influence feasible. Now we can hope for a favorable way out of the situation more than ever, considering the participation of this organization with international influence and one of the best lawyers in the world, who will work on the behalf of the medics and their successful homecoming. Dear colleagues, Considering the above information I invite you to a press conference on February, ninth, 2007, Friday at 1 o’clock in conference room number 2 in BFU (Bourgas Free University), Bourgas, in order to introduce you to the details of the case. The press conference is realized through the polite management of BFU.